The morning of 21st February 2018 dawned cold but sunny, and with a free day in a dull, wet winter, we made for the start of the footpath up Gleann Leireag (NC1531). This crosses the Allt Mhathain (burn of the bear!) on a wooden bridge and is sign-posted to Tumore, on Loch Assynt. 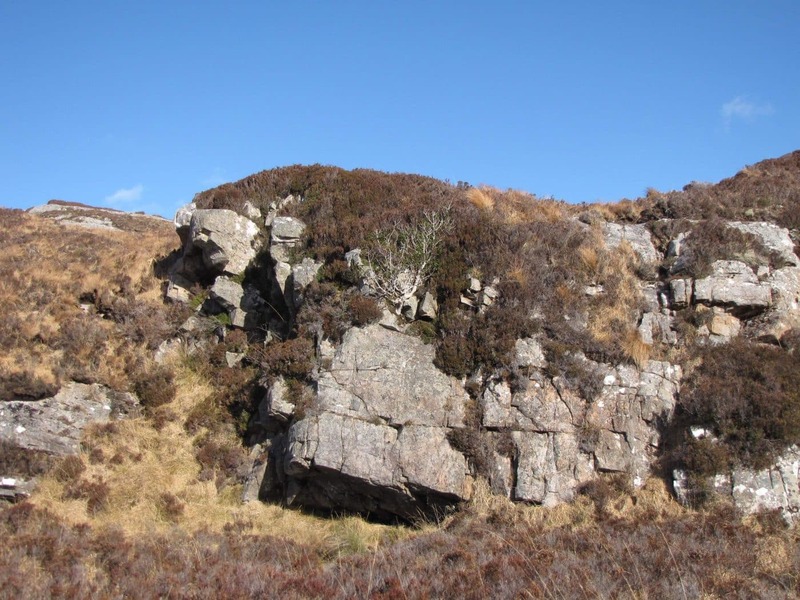 Our first stop was a heathery boundary bank by the river at the south-east corner of the old sheiling Ruigh Dorch. 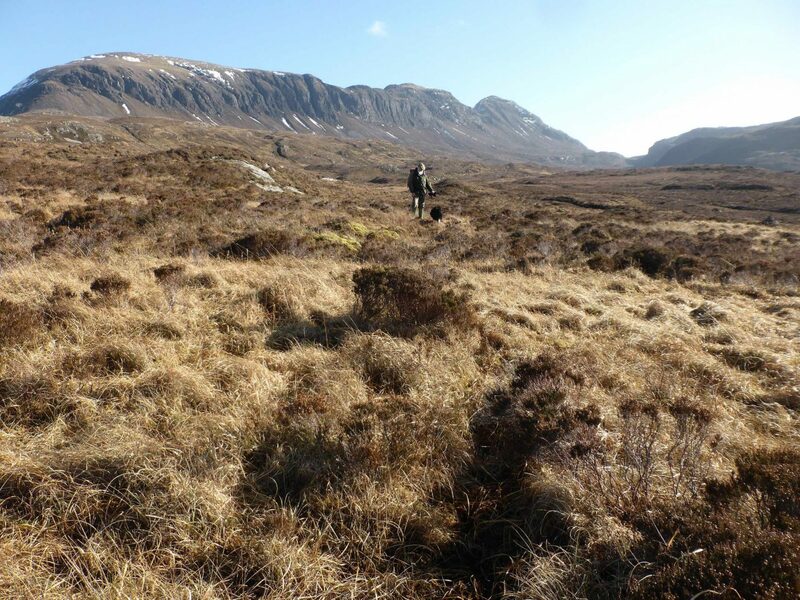 Here up to four female adders have been seen basking in the sunshine, albeit a little later in the year, but none were visible on this occasion. The narrow path, often muddy, and running with water in places, climbs to a viewpoint over Loch Uidh na h-Iarna. There we perched on boulders for our lunch, with splendid views of Quinag, still snow-streaked, and in the background the pleasant sound of the small waterfall that drains into this loch from the larger Loch an Leothaid. Again, this spot has afforded views of otters in the past, but we were not so fortunate. We continued along the path, now slightly wider, until we reached an isolated gate in the one-time fence (just galvanised posts) along the boundary between Ardvar and Quinag estates (NC1730), and then turned up the fence-line to retrace our steps to the road at a higher level. 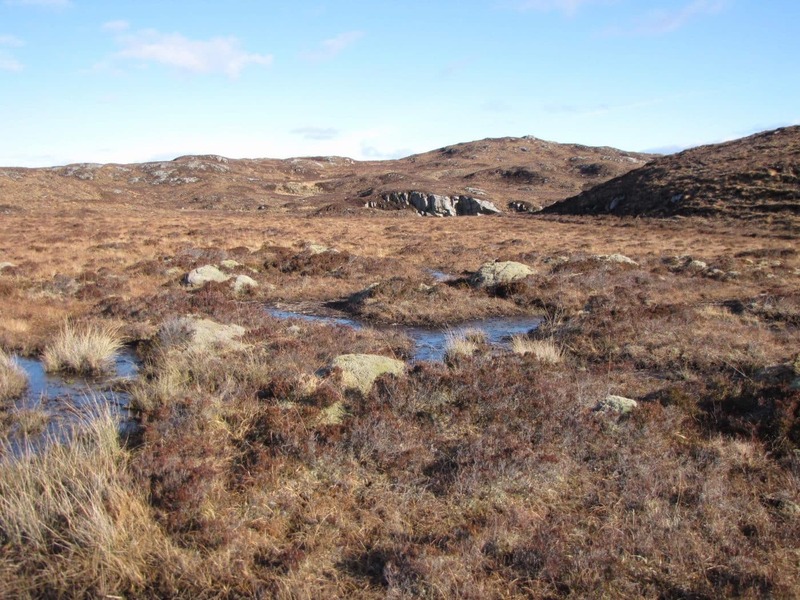 The prevailing vegetation hereabouts is described technically as ‘wet heath’, but for wet read saturated, so we made for the drier northern side of a wide valley housing one of the upper tributaries of the Allt Mhathain. We soon reached an area in which no signs of human activity are visible (photo 1), which is refreshing, and shortly afterwards the natural history began to look up a bit. A large dark caterpillar of a fox moth was basking on heather and the only bird seen all day, a solitary hooded crow, flew over. This lack of birdlife is typical of the interior of Assynt during the winter. 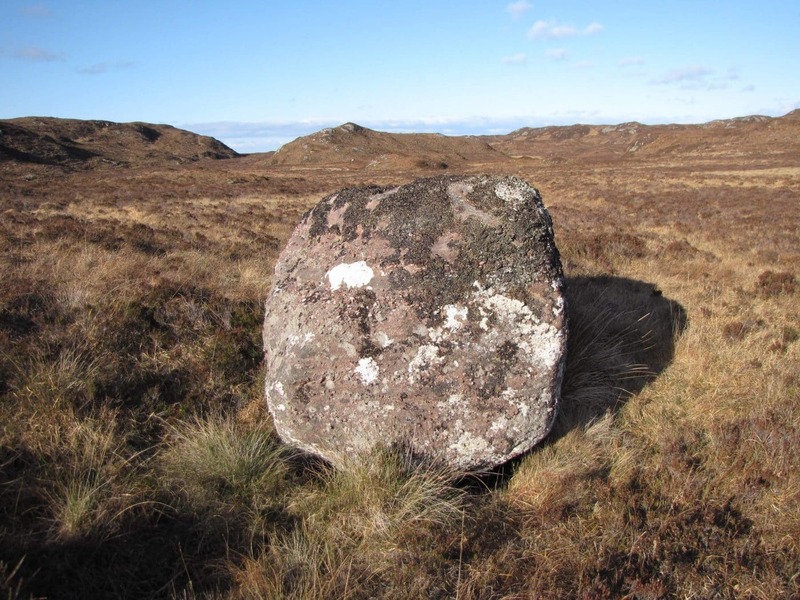 Scattered erratic boulders are a feature of the Gleann Leireag area, large lumps of Torridonian sandstone sitting on the much older gneiss platform (photo 2), part of a boulder trail from Quinag dumped during the last glaciation. 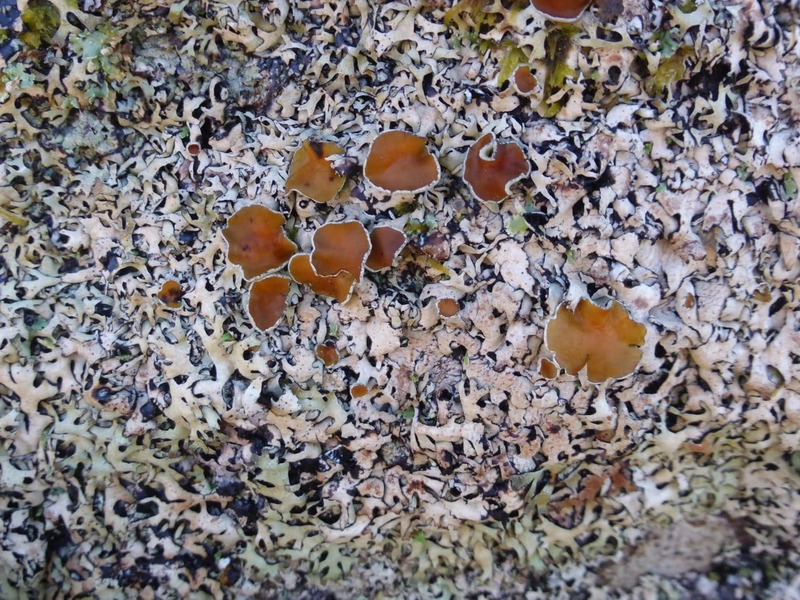 They support a characteristic lichen flora, distributed in micro-habitats of choice. 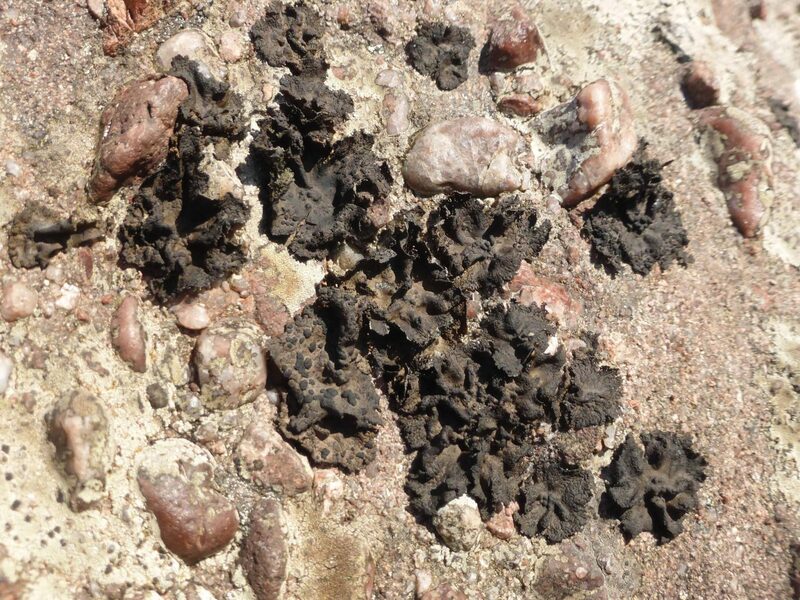 These included, on a shady face, Parmelia omphalodes, with large red-brown fruiting bodies or apothecia (photo 3); this is one of the smaller foliose lichens of nutrient-poor, siliceous rocks in moorland areas. Elsewhere, on sunny faces where water trickles down, were the dark brown centrally-stalked thalli of one of several species of rock-tripe Umbilicaria torrefacta, which has small black apothecia and perforated lace-like margins (photo 4); this is a strictly upland species. We then made our way along the valley towards a small un-named lochan in the middle distance (NC164312), one of two feeding the Allt Mhathain (photo 5). Here, the shiny leaves of broad-leaved pondweed Potamogeton natans were beginning to unfurl just below the water surface. Close to the edge more insect life was spotted, a small active group of whirligig beetles Gyrinus sp. Gwen fished out of shallow water at the edge of the lochan a tiny scrap of filamentous vegetation which looked a bit odd. 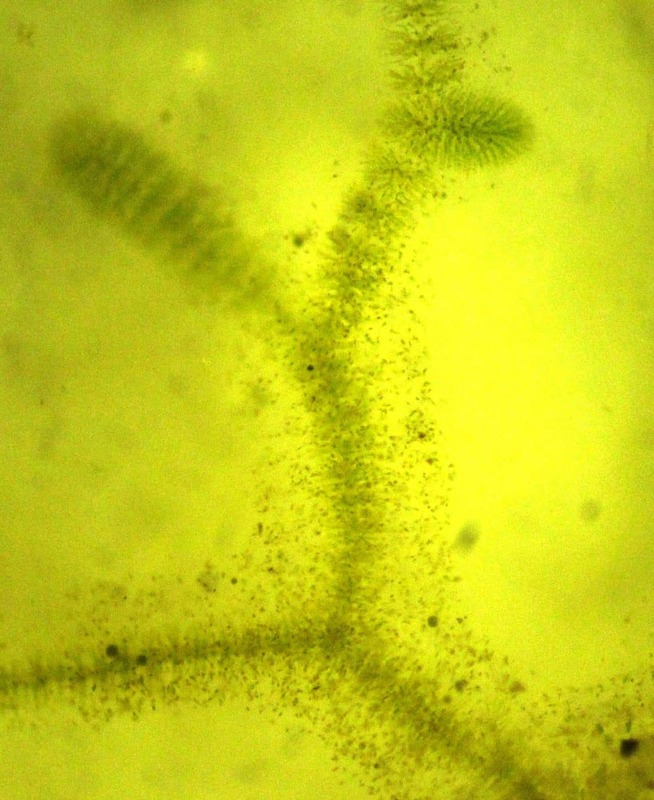 Bagged and later microscoped, it proved to be the frog-spawn alga Batrachospermum vagum, an unusual freshwater example of the predominantly marine red algae. Close-up, it looks like a miniature bottle-brush, with tight clusters of segmented side branches radiating off the main axis (photo 6). 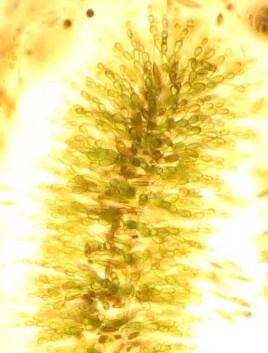 In time the older parts of plant become invested with gelatinous sheaths that are a magnet to much smaller, single-celled algae such as desmids and diatoms (photo 7). 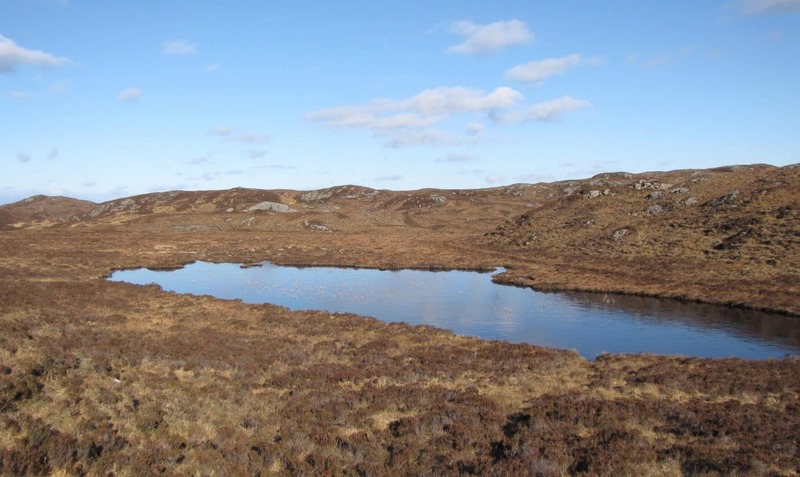 To the north-west of the lochan there is an extensive saddle mire, patterned with deep boggy pools, interspersed with mossy hummocks (photo 8). In one of these pools an immature greater water-boatman Notonecta sp. briefly surfaced to take on air. Most of the hummocks were capped with the familiar woolly hair-moss Racomitrium lanuginosum, but one heathery example had a different look to it (photo 9). 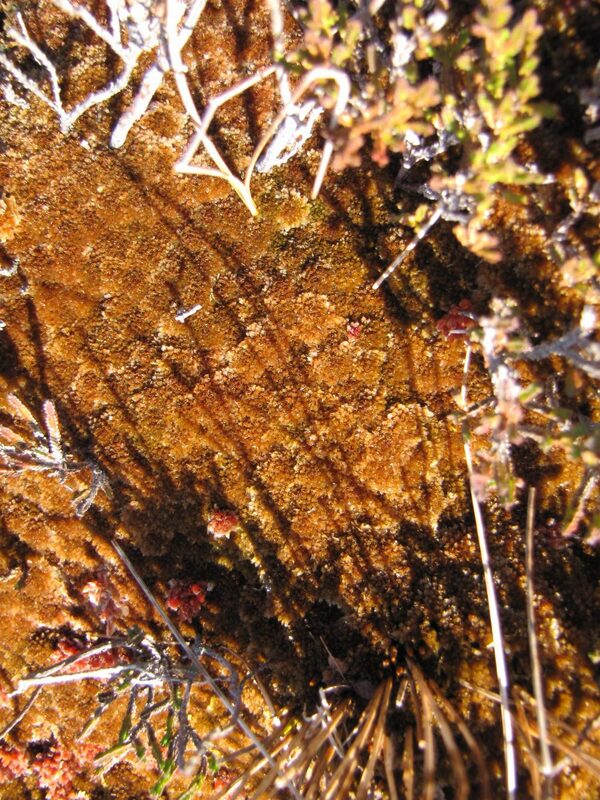 It was covered with a tight carpet of the tobacco-brown cushions of one of the rarer bog-mosses Sphagnum fuscum (photo 10). 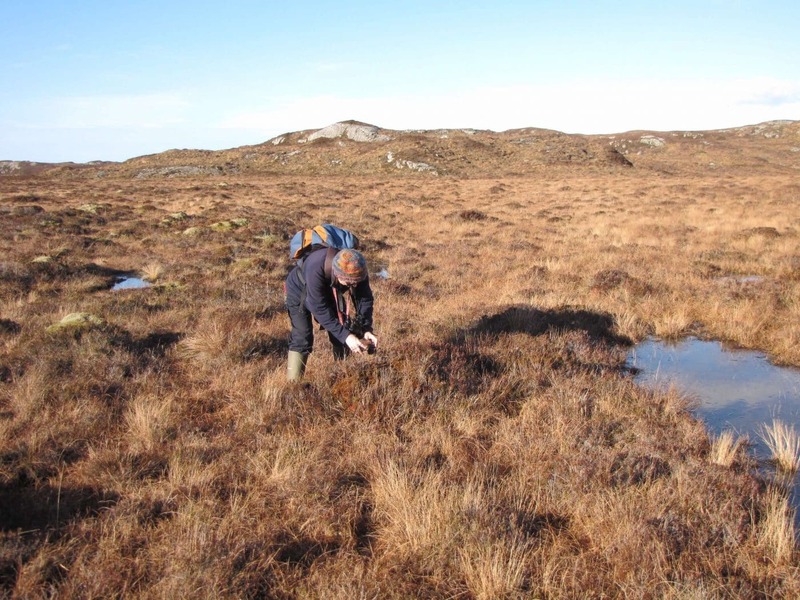 This was recorded for the Flora of Assynt in only 12/164 tetrads (and one since); it does not survive in otherwise suitable areas that have either been dug for peat or extensively burned. After this chance discovery we made our way to the road, then back to Nedd for a warming cup of tea. For connoisseurs of words, ‘plodgy’ is a term of uncertain etymology, but which seems to admirably sum up the character and pace of such a walk. Five days later, one of us (IME) returned to the vicinity of the lochan to take more photographs. I made a detour on the way back to a large gneiss crag across the valley of the Allt Mhathain (NC165314), which we had spotted on the first visit (photo 11). 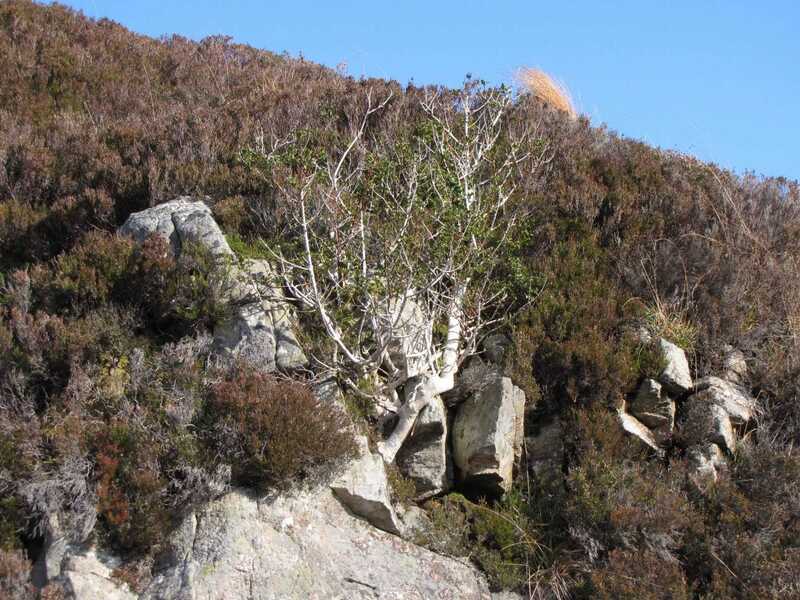 It repaid the effort, since its vertical face supported two gnarled old hollies Ilex aquifolium, noteworthy in a generally tree-less landscape (photo 12); there was also a large patch of ivy Hedera helix surviving, similarly, out of the reach of grazing animals. 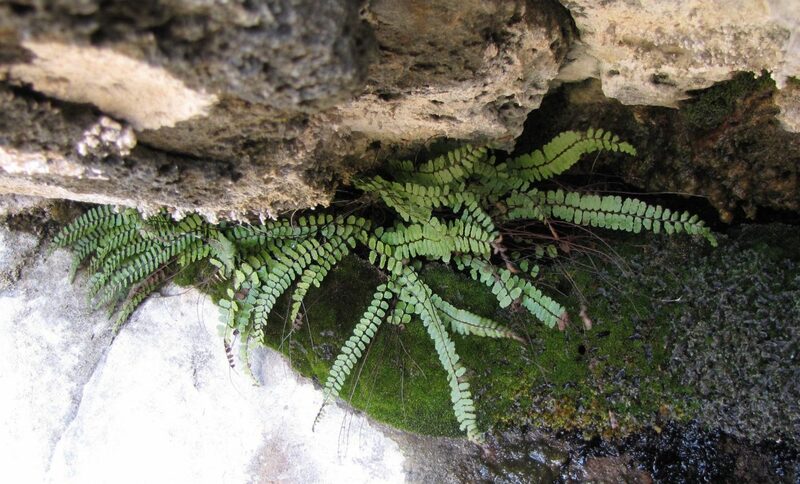 Mossy crevices in overhangs housed the base-loving subspecies of the small fern maidenhair spleenwort Asplenium trichomanes quadrivalens, which has well-spaced leaflets or pinnae (photo 13), and occurs most abundantly elsewhere in Assynt on old mortared walls. 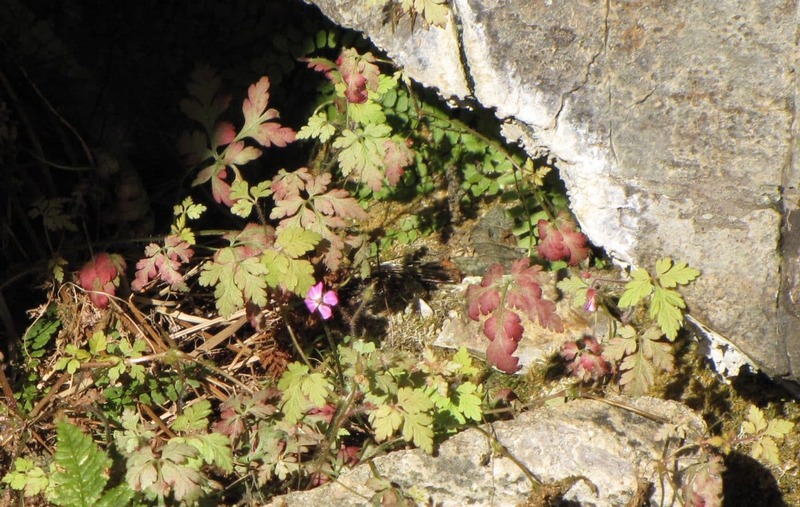 Tucked into a sheltered sunny pocket amongst boulders below the crag was a small patch of herb-robert Geranium robertianum, already in flower (photo 14). The first half of this Gleann Leireag walk, although scenically stunning, as ever, was somewhat lacking in features of natural history interest, which is forgivable for cold, if bright, February days, but the second half quite redeemed it.